Glock 10 + 1 Round Double Action Only 10MM w/Short Frame/Fixed SightsGlock adapts the short frame design to the powerful 10MM auto cartridge.The Glock 20SF has a more comfortable frame, controllability and practical accuracy are enhanced without any loss in power. The Glock 20SF provides maximum sight radius and can accept the optional 6" 10MM auto barrel for absolute power and long range precision. 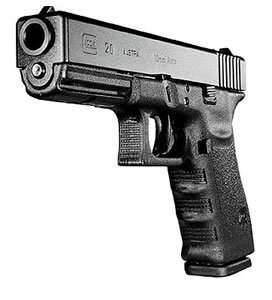 DISCLAIMER: GLOCK is a federally registered trademark of GLOCK, Inc. and is one of many trademarks owned by GLOCK, Inc. or GLOCK Ges.mbH. Neither Hinterland Outfitters nor this site are affiliated in any manner with, or otherwise endorsed by, GLOCK, Inc. or GLOCK Ges.mbH. The use of “GLOCK” on this page is merely to advertise the sale of GLOCK pistols, parts, or components. For genuine GLOCK, Inc. and GLOCK Ges.mbH products and parts visit www.glock.com. This is by far the best and most fun gun to shoot - just wish ammo was a little less per round.